Located just 20 minutes from Manuel Antonio is the Damas Estuary and Mangroves. The mangrove forest is one of the most important remaining ecosystems in Costa Rica, covering thousands of acres, and is home to a large number of birds, reptiles, mammals, and insects. 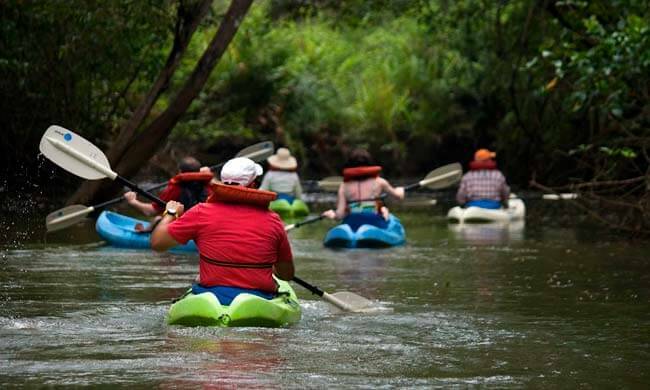 Your adventure begins when you are picked up from your hotel and driven to The Damas Estuary, where you board your kayak or boat, and get ready to embark on an incredible authentic wildlife experience. Your bilingual guide will lead the way through the winding estuaries and mangroves. Experience curious families of monkeys as they migrate across the mangrove ecosystem in search of food and adventure. Look out for sloths, green iguanas, crocodiles, spectacled caimans, boas, crab-eating raccoons, and silky anteater, as well as a number of bird species like herons and pelicans. Also discover how the native trees of Costa Rica replenish the environment worldwide, yet sustain themselves for decades of growth. Enjoy a wonderful traditional Costa Rican meal in a local restaurant, before heading back to your hotel! This tour is excellent for adventurous individuals, families, or groups who want to learn and experience nature first-hand. We recommend that you are relatively fit for paddling in an open-seat kayak for a few hours. For the travelers that want to experience nature when the nocturnal rainforest is most active, tour is available at dusk. Age limitations: 8+ for kayak tour. Boat tour has no age limitations. Your tour includes: Round-trip transportation, bilingual guides and naturalists, kayaks and all equipment needed, lunch, snacks and refreshments. What to bring: Comfortable clothing and sturdy shoes that might get wet, swimsuit, repellent, towel, camera with a flash. *Please note: stated tour price is for Manuel Antonio area. Tour is available at an additional cost from Jaco area. Travel from Jaco is approximately one hour. Inquire for more details.